Woahhhh! Thanksgiving week? Anyone else just get used to writing 2016? Goodness gracious, this year is flying, and I can’t believe I’ve already worked with candy canes and peppermint extract more than once in the past few weeks. What is this life?? I have been non-stop cookie baking for the last 2 months, but here and there I’ve stopped to bake/not bake (yay, no bake!) treats for recipes to share before and after the cookie explosion that I hope to make an annual event on the blog. I only have 3 more cookies to bake for the party! 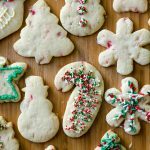 Perhaps it’s time for you to brush up on my cookie baking basics posts (tips and tools) before we get started? It’s good practice to have some of that info in the back of your mind before you go all Christmas-cookie-cooky. Last weekend, I wanted to throw together an easy recipe that was Christmas-esque, but since Matt was away for the weekend and we have a little human to take care of, I needed to keep it simple. 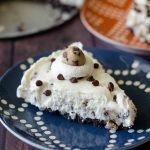 In March of this year, I posted a no bake mint chocolate chip pie that was out-of-this-world good and also went a little viral on the blog, among my readers, and on Pinterest. Since the theme of the season is peppermint mocha/mint chocolate (ok, also gingerbread), this was sort of a no-brainer. I took what I had and ran with it, candy canes and red food coloring in hand. Except the candy canes in place of the mini-chocolate chips I used in the mint chocolate chip pie were a huge mistake. HUGE. I should have known that putting chopped candy canes into a wet mixture of cream cheese and whipped cream would be a disaster, but I didn’t. Nope. Not even a little bit. I popped that baby in the fridge and was thinking I nailed it, until I took it out the next day, undid the springform pan, and watched the pie shloop (yes, shloop) down into a drippy mess. Don’t worry, I rectified the situation by containing the shloop and putting the whole thing in the freezer. Worked like a charm! We (and a few taste-testers) ate that whole pie in, oh, 2 days. But not before I tried again with ingredients I knew would work better. 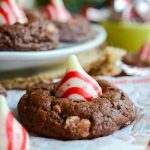 Enter Candy Cane Hershey’s Kisses. 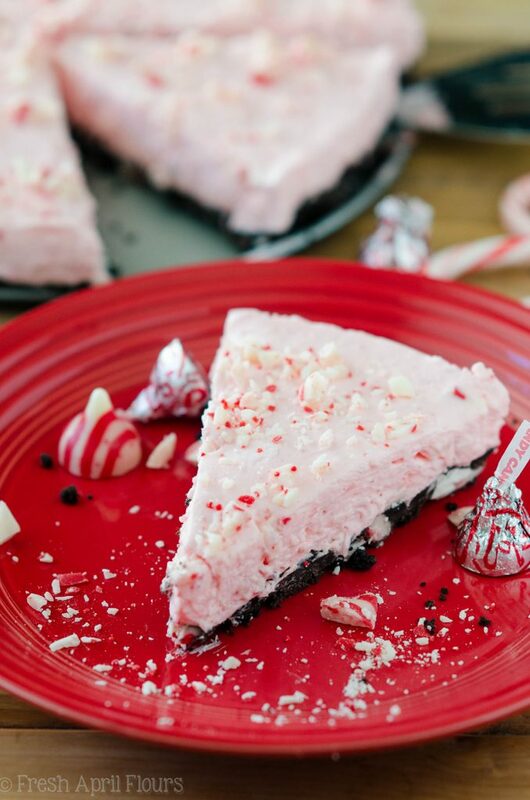 The white chocolate with candy cane bits route was so much better than the candy cane route, and I’m really glad it worked the second time because as much as I loved this pie, I was running out of fridge/freezer space and people to give slices to. DARN. 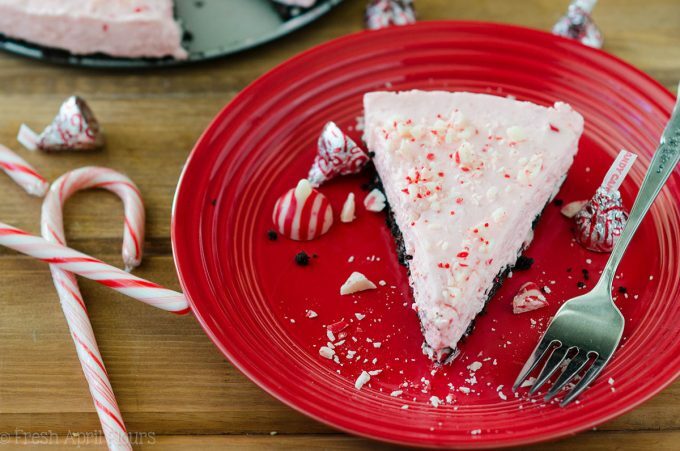 I made a few tweaks to the original mint chocolate chip pie– I downgraded the peppermint extract a bit to prevent the toothpaste effect and to make up for the added pepperminty business from the Kisses. I also tossed some chopped Kisses into the Oreo crust. SUCH a great idea. 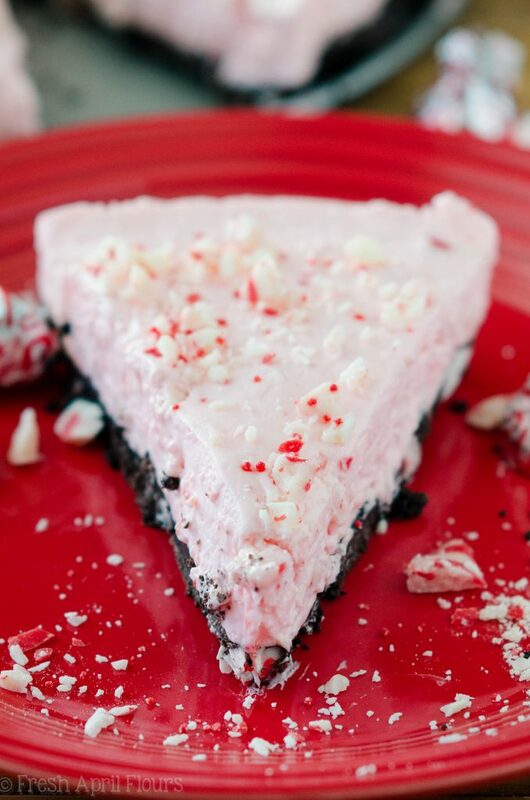 Crunchy, minty, creamy dreamy chocolate all over the place in this pie. Nothing wrong with that. I also used red food coloring instead of green food coloring, for obvious reasons. But hey, whatever color you’d like to make your pie, go for it. Or leave out the food coloring completely! It will still taste the same. But isn’t that pink pie just so pretty? While this season comes with cold weather, it’s always nice to have a dessert on hand that doesn’t require oven space or a ton of ingredients, and one that can travel well in the weather. There’s nothing I hate more than a dessert that requires refrigeration that needs to travel in 90º weather. Awful! Keep this dessert in the trunk on a longer car ride and you’re golden! I just got real sad for the super cold weather that is coming our way. Ohhhh, Pennsylvania. How I love and loathe thee. 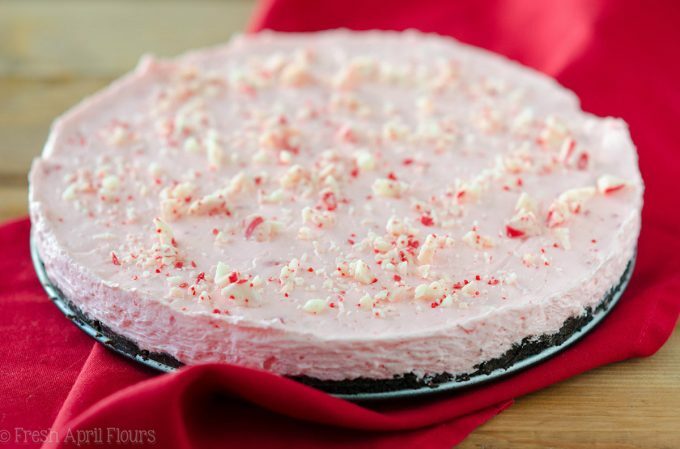 I can guarantee that this candy cane crunch no bake pie will tickle your Christmas treat fancy and why not whip it up for Thanksgiving this week? While I do love me some turkey, stuffing, potatoes, green beans, gravy, cranberry sauce, allofthethings, why not top off the meal with a nice segue into the holly jolly season? Plus, it’s about to be cookie city all up in here– let’s keep our dessert options open! 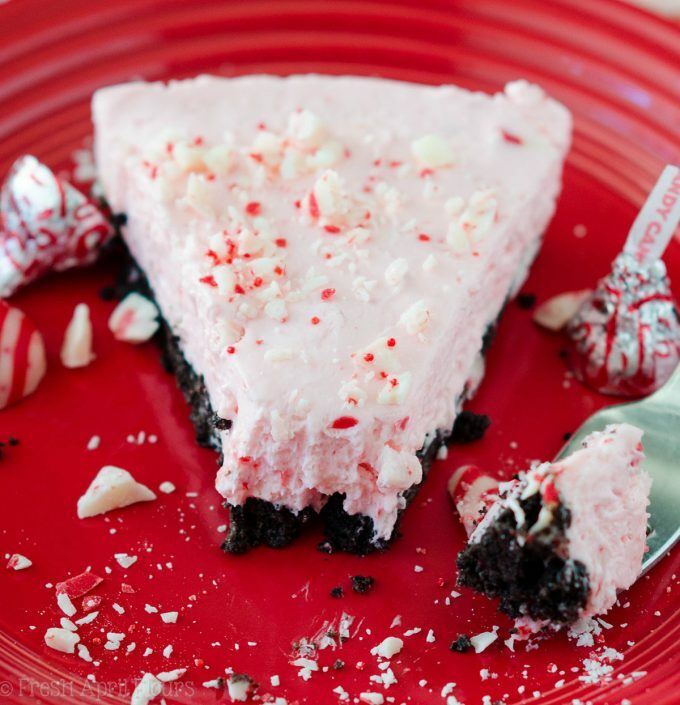 Creamy, minty pie studded with chopped Candy Cane Kisses all on top of a crunchy Oreo cookie crust. Place the crushed Oreos and 1/4 cup of the chopped Kisses in a medium size bowl. Toss together to combine. Drizzle the melted butter evenly over the mixture. Stir to mix completely, then press evenly into the bottom of a 9" springform pan (a regular 8" or 9" pie plate will work just fine as well). Chill in the refrigerator for 30 minutes. In a large bowl with a hand mixer or the same bowl of the stand mixer (no need to clean) now fitted with the paddle attachment, beat the cream cheese on medium-high speed until smooth. Reduce mixer speed to low and add the powdered sugar, increase the mixer speed to medium-high, and beat again until smooth. Add the vanilla and peppermint extracts and the red food coloring (if using) and continue beating until smooth. Scrape down the sides as necessary. Turn off the mixer and fold in the cold whipped cream with a large spatula until red swirls disappear. Pour 2/3 cup of the chopped Kisses and mix again with the spatula until evenly dispersed. Pour the filling onto the prepared crust and spread evenly with the spatula (I prefer to use this small offset spatula). Sprinkle with remaining chopped Kisses. Cover with foil or plastic wrap and chill in the refrigerator at least 4 hours (for best results, overnight) before serving. Store leftovers covered tightly in the refrigerator up to 5 days. Pie can be wrapped tightly and frozen up to 2 months. Thaw in refrigerator overnight. 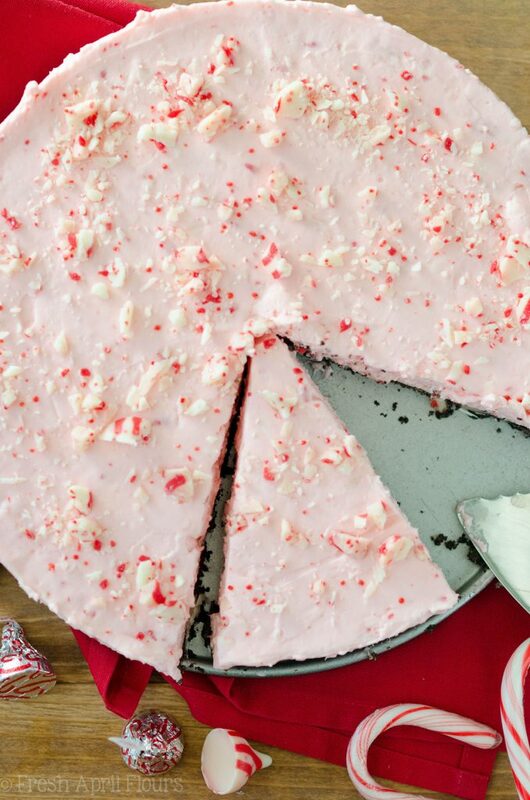 Giant peppermint bark! I didn’t even think about that! This year has flown by!! 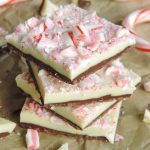 I wanted to make some peppermint treats in advance of the big season, but couldn’t bring myself to do it. 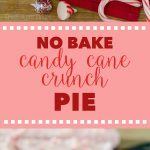 That just means after Thanksgiving candy canes will be flooding my kitchen so I can make great treats like this pie 😉 Happy Thanksgiving, Lynn! Yes, ma’am! After Thanksgiving, the candy cane game is strong!! It totally might. 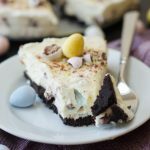 This pie is just too good!